Probably the biggest “X-factor” in the ongoing effort at reviving the global economy is China. China is seen by many as the world’s emerging industrial powerhouse and its relationship with the United States is considered to be crucial for its own development, as well as for the strength of the world economy. With the U.S. in the role as the world’s premier consumer and China considered to be the major industrial player, all eyes are on the respective economies of these two great nations. There are two dominant views regarding China’s economic outlook and its prospects for total recovery from last year’s credit crash. The first one states that China is essentially a repeat of the Soviet Russian experience in that China’s dictatorial control by its communist rulers will keep it from achieving true “superpower” status. The other view maintains that China is, in fact, on its way toward economic superpower status that will eventually allow it to eclipse the U.S. The pro-China view posits that China is well on its way toward developing its own internal economy and that its former reliance on the U.S. for exports is gradually fading. In other words, under this view China is “decoupling” from the western nations as it becomes less export-driven and more reliant on a strengthening domestic economy. Elsewhere he writes, “But there is one nation that is riding a bubble right now and that nation is the People’s Republic of China. Henry Kissinger once told President Nixon that the Chinese People are the smartest on earth. Yet there is a defect in their official national character that has brought them from very high levels of achievement to very low levels of failure a dozen times over the past 4,000 years. They would build dynasties and conquer nations on all sides, forcing these captive people to pay tribute to the Chinese Imperial Court. But then pride turned to arrogance and arrogance caused them to make mistakes – big mistakes and a lot of them. Most of these mistakes had to do with corruption at home, and that is exactly what is showing up these past few years…. “First, after the October 2008 meltdown, the mood was grim and the term "Financial Crisis" was on everybody's lips. Business announced hiring freezes all over town - although I did not hear of any layoffs in the Multi-national companies I frequent. Down in Guangzhou, of course, it was a different story - as millions of migrant rural workers in Guangdong Province factories were laid off, and there were many riots. “What a difference a $600 Billion stimulus makes. Beijing flooded the country with stimulus money, and it seems to be working (sentiment-wise). Everybody is now optimistic again. Whereas before, there was a lack of interest in the high-priced real estate here - the interest and investment is back. Companies are optimistic and looking forward to the future - if they are NOT export-driven. But those companies that specialize in exports are still sucking wind. The auto and auto parts industry (for export) have been decimated. Come to think of it - I haven't seen an expat buddy of mine lately since he got laid off from his auto parts company several months ago. But American and European expats from all sorts of industries are getting called home in droves - and that is continuing. “Hard to figure out this multi-faceted economic elephant - but if I had to put it in a nutshell - it's this: Export-dependent companies are hurting, but what with the stimulus freeing up bank lending and infrastructural development, companies that focus on domestic production and consumption are doing well and are optimistic about the future again, even though there is an employment problem with young college graduates that can't find a job (the job market is not expanding, to my knowledge, but there are no mass layoffs). A definite prediction of where China’s economy is headed in the longer-term outlook is beyond the scope of this commentary. Our main concern is the intermediate-term outlook for China’s stock market, which in turn tends to lead economic performance. 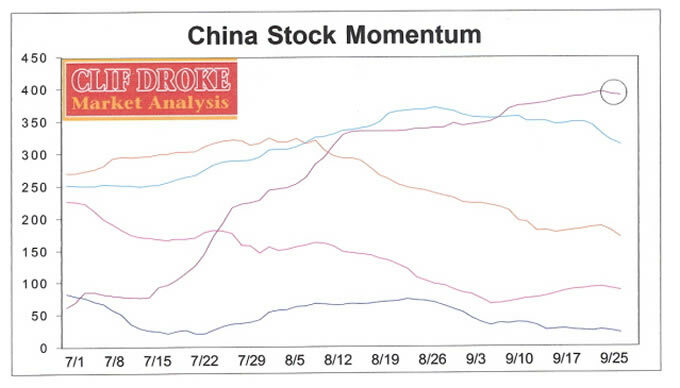 For that reason we developed the CHINAMO internal momentum indicator series earlier this year and are using them to point to strength or weakness within the market for U.S.-listed Chinese shares. CHINAMO has a secondary application of predicting where the general economy for China is headed in the interim outlook since major stock price trends tend to precede, or at least coincide with, economic trends. As the circled indicator shows, long-term momentum has apparently peaked and is just starting to reverse its uptrend. Assuming this continues to accelerate into a downward trend it will eventually lead to a bumpy ride for the China stocks and another fall in the Shanghai index likely to follow. The most spectacular economic development is China's. Ever since the economic reforms began in the late 1970s, businesses in China have been booming, and China has become one of the most developed manufacturing economies in the world. China has been booming because unlike America, its politicians don't have to sell out it's people to enhance their power. Political correctness is absent in China and government officials who accept bribes quickly find themselves at the end of a rope.